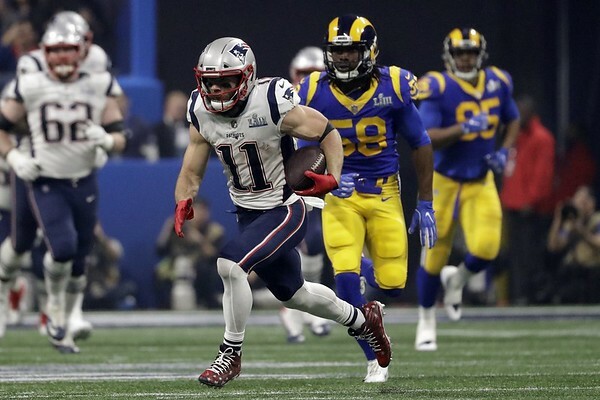 Written by DENNIS WASZAK Jr.
ATLANTA - Julian Edelman was forced to watch only as a spectator as his disappointed Patriots teammates trudged off the field a year ago as Super Bowl losers. The two met at midfield with confetti flying, and embraced for several moments - eyes filled with the tears of champions. It was an incredibly satisfying ending to a big-time comeback season for Edelman, a guy considered by Brady to be like a little brother - some teammates even jokingly say they have a “bromance” - and widely regarded as one of the greatest slot receivers in league history. What he did in this Super Bowl was exactly what the Patriots’ offense was missing in last year's 41-33 loss to Philadelphia. Posted in Newington Town Crier, General Sports on Sunday, 3 February 2019 22:42. Updated: Sunday, 3 February 2019 22:45.